I wish no ill to Jussie Smollett. As for Empire, I’ve never seen the show (as I’m not much of a TV watcher) and have no feelings about it, positive or negative. But I despise falsehood and duplicity, and as the Smollett case has turned into a complete fiasco, the truth meter inside me stirs me to write. Sorry, but Smollett was not exonerated. Hardly. In other words, Smollett cut a deal. Second, even without the statement from the prosecutor, an innocent victim does not do community service or forfeit $10,000 to the city. Obviously. A woman claims to be raped and beaten by four male assailants. The police then claim that she set the whole thing up and charges are brought against her. All charges are then dropped against her after she does community service and pays a fine to the city. That is not being exonerated. That is striking a deal. The guilty, not the innocent, strike deals. If the woman had been raped and beaten, do you think she would have been required to do community service and pay fine? Of course not. How is this not totally obvious to all? How could anyone still believe that Smollett was somehow exonerated? If he was, in fact, assaulted by nefarious strangers, where are they? Where’s the investigation to find his attackers? So, either they’re telling the truth (in which case the prosecutor did the city a real disservice by dropping the charges with a mere slap on the wrist) or they’re lying about being paid by Smollett. And this whole affair has nothing to do with racism and homophobia (the very allegations that brought this to national attention). Those are strong words from a high-level, career officer. Police don’t lightly issue their own guilty verdicts in public. To repeat: No one can accuse either Mr. Johnson or Mr. Emmanuel of being racist or homophobic. And in case you missed the news conference, neither of them were wearing MAGA hats. Yet they both spoke against the outrage of all charges being dropped in the strongest possible terms. Rightly so. 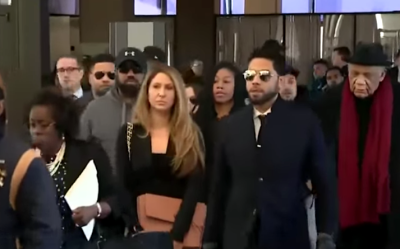 Again, I wish no ill for Jussie Smollett or the people involved in Empire. I simply write to give voice to the frustration experienced by many when truth and justice are mocked in the public square. That would have been glorious. But that is not what happened. And that is a loss for all involved. And Smollett’s legacy will remain deeply muddled. The choices were: 1) He's obviously innocent! 2) Chicago is corrupt! 3) Something else. Only 1 percent believed Smollett was innocent. And that will be hard to shake.